Beth is internationally recognized thought leader in networks, social media, philanthropy, wellbeing in the workplace and training. 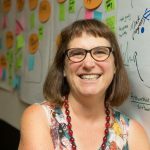 Beth has over 35 years working in the nonprofit sector in capacity building and has facilitated trainings for thousands of social change activists and nonprofits on every continent in the world. She is an in-demand keynote speaker and workshop leader. Named one of the most influential women in technology by Fast Company and one of the BusinessWeek’s “Voices of Innovation for Social Media,” Beth was Visiting Scholar at the David and Lucile Packard Foundation 2009-2013. She author of the award winning Networked Nonprofit Books and The Happy Healthy Nonprofit: Strategies for Impact without Burnout (http://bit.ly/happyhealthynpbook) published by J.Wiley. She writes “Beth’s Blog,” one of the first nonprofit blogs. Her clients include foundations, government agencies, and nonprofit organizations.